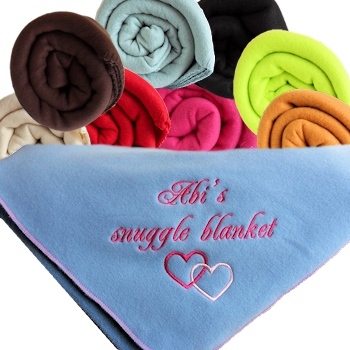 Personalised throw blanket made from super soft easy care polar fleece fabric in a soft sky blue colour. Personalised throw blanket made from super soft easy care polar fleece fabric in a soft sky blue colour. Choose your blanket size, we can make you a small baby size 75x100 cm or a kids size 100x150 cm or a adult size 200x150 cm. All sizes are measured approximate.